“RED” is neither a good movie nor a bad one. It features actors we like doing things we wish were more interesting. He gave the movie 2 stars out of 4. This Bruce Willis vehicle opened Friday, October 15, 2010. I was there at the first showing, 1:45pm at the Empire Empress Walk. I realise not many are going to show up for an afternoon performance but there were only 10 of us in total. The 7 o' clock show will probably be a better measure. While I agree with Mr. Ebert - this is an okay movie - I'm assuming that Mr. Willis and the other stars will bring out the public in hordes. Let's remember that production companies apparently count on that opening weekend to recoup their investment. From there on in, it's gravy. 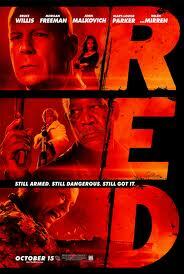 The story for this movie is based on Red, a limited series comic book of the same name published by DC Comics. Limited series means it's a comic but of a set number of issues. It consisted of 3 issues published in 2003 and 2004. Summit Entertainment optioned the comic as a feature film in 2008. Of note, the original story of the comic has been changed so the film's premise is different. Apparently the movie is less violent than the comic and is also comical while the comic book was serious. A little odd when you think of the original meaning of the word comic as in "comic book". Without giving you a spoiler alert, the movie is basically a spy shoot'em up romp with a comedic slant on things. Then again, that comedic aspect seems to be a trademark of the films of Mr. Willis. Bringing Helen Mirren into the production just adds to the humour. Picture seeing "Queen Elizabeth" firing off various weaponries. By the way, if you have never seen the film The Queen starring Mirren, see it; it was fabulous. It is quite the cast. Mary-Louise Parker now famous for starring in the TV series Weeds, first came to my attention with a part in another celebrated television series, The West Wing. Morgan Freeman needs no introduction but as an aside, did an excellent Nelson Mandela in the movie Invictus. John Malkovich is always good. Brian Cox may seem unknown but did have some visibility as William Stryker in the film X Men 2. I will add 2 other notables to the list. I was surprised to see Richard Dreyfuss; picking up some easy cash I guess. There are too many films to mention but one I've never forgotten was Whose Life Is This Anyway? in which he had the lead role. Fabulous. The other notable was Ernst Borgnine. My goodness, that man is going to be 94 on January 24, 2011! He's been around since... the beginning of time. Amazing. It is interesting to note that there were 9 weeks of filming starting in January 2010 in and around the Toronto metropolitan area. I was a little surprised when reading the final credits to see a familiar Ontario logo, that of the Ontario Media Development Corporation which apparently invested in this production. Getting film companies to shoot in Ontario adds to the local business. This is an okay film. I guess it's a question of whether you want to fork over your moo-la for just okay. The Social Network, which had zero car chase scenes was a far more engrossing story. By the way, I am getting progressively amused at how the stunts in movies keep getting more and more impossible. I made the comment in reviewing the Angelina Jolie movie Salt during the summer that one important aspect of action adventure is to give me the illusion that I could be doing this too. Yes, I'm not James Bond - not even remotely close. Ha! - but at least for a moment, for my 2 hours in the movie theatre, I like to have the fantasy that maybe, just maybe I could be doing these things. Unfortunately, we have arrived at a point where the stunts, in order to shock us, have become not just improbable but physically impossible. Like Bugs Bunny in High Diving Hare said when he failed to fall to the ground, "I know this defies the law of gravity, but you see, I never studied law." I am losing the illusion that I could be doing the stunt, that I could be the hero. Then again, maybe I should go watch Jackass. Now there's a film which has stunts all of us could do and I'm certain I could screw up just as well as Johnny Knox!